THE ESSENTIAL GUIDE TO SRI LANKA. If you're planning a trip to our beautiful shores be sure to download The Sri Lanka City Guide. Packed full of useful tips, reviews and insider information. This guide to Sri Lanka, is packed with information on some of the best places to stay, to eat, to shop and the best activities in the country. If you want to avoid the standard tourist spots then the Sri Lanka Guide App is definitely for you. 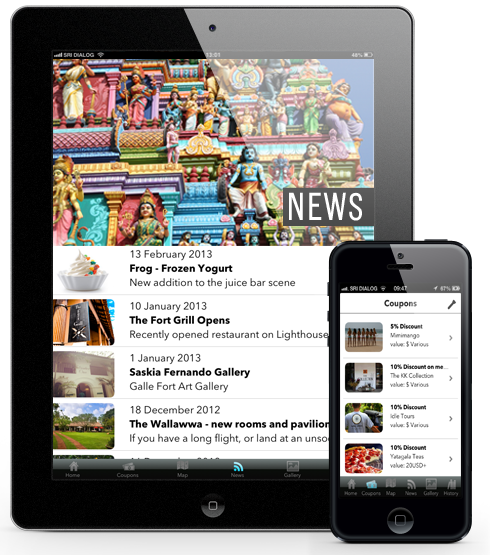 Now we're are not saying that this app will replace your Lonely Planet or your Rough Guide, they are essential. But it is the perfect partner as we live and work in Sri Lanka and are constantly visiting the listings within the app and therefore constantly updating the information – our finger is somewhat on the pulse. Almost all the venue's/restaurants/hotels/activities listed on the Guide have been visited by one of our team and all details within are a combination of those from the owners, our opinions and those of previous travellers, where we list a venue, but have not visited it we are clear about this. Once downloaded the app is fully usable offline however you must download all the info within the app first. As apple has a limit on how large an app can be downloaded using mobile internet – we decided to keep initial download low. In the app you must visit each page whilst connected to the internet to get the best performance – it will then be kept on the guide for offline use. We advise you purchase a pay as you go sim-card from Dialog Mobile – calls are cheap as chips! Discount vouchers from retailers and café’s - more being added all the time! Emergency numbers and contact details of airline offices and other major service providers. Maps, with GPS tracking, perfect for avoiding those pesky roaming charges. We have been forced to use third party (Google Maps) mapping software as the native Maps app is pretty low on detail – especially in Sri Lanka. The map will work offline once you view the entire map - it will save everything you view for offline viewing.